Goichi Suda has one of a handful of names in the world of video games that is genuinely recognisable to those who love the form. 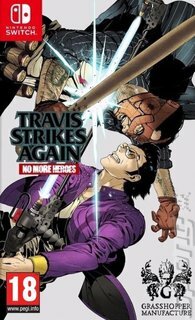 Although he's nominally attached to all of his studio Grasshopper Manufacture's output, however, Travis Strikes Again: No More Heroes is being billed as his return to the director's chair. As fans might be unsurprised to hear, it's a return to the wilder, weirder side of gaming that has a good home on the indie-friendly Switch. Travis is looking for six mysterious Death Balls, aka cartridges for an extremely rare and even more dangerous games console called the Death Drive Mark II. In tow is Bad Man, whose daughter Travis killed in the first No More Heroes game, out to use the wish granted by the person who collects them all to revive his girl. The catch: you have to beat them all, too. The format, then, is games-within-a-game, a format that allows Suda to get suitably weird and meta. The foundation of the game is hack 'n' slash gameplay, which you can battle through either solo or in two-person co-op. There are technical elements, such as layering up different abilities to customise your character, but really it's all about style and building cool moments. You might, for example, fight through waves of enemies in order to get parts for a motorbike which you'll then use to compete in drift races with vector graphics. Or there's the Resident Evil homage with a mansion foyer serving as a central hub, from which point things only get weirder. Needless to say, fans of the medium are going to get a kick out of this one. There's plenty of fun, approachable action in Travis Strikes Again, but it's the weird playfulness that will really keep you coming back.